A monastery in the English countryside was having a hard time with its cash flow because of the dwindling number of monks available to help with all the work. 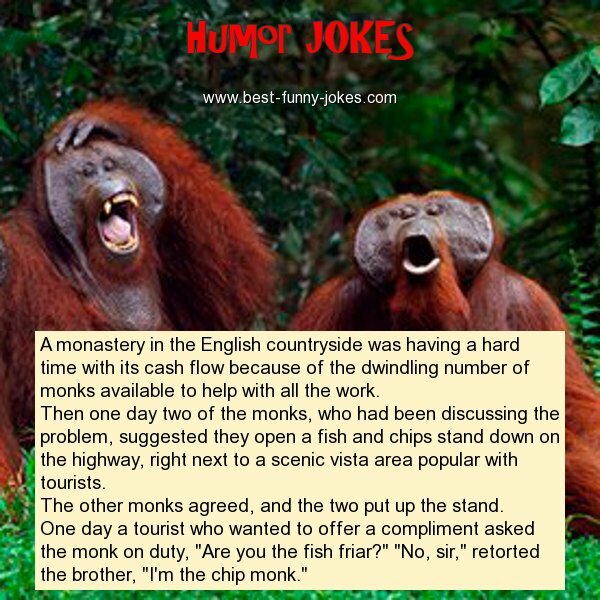 Then one day two of the monks, who had been discussing the problem, suggested they open a fish and chips stand down on the highway, right next to a scenic vista area popular with tourists. The other monks agreed, and the two put up the stand. One day a tourist who wanted to offer a compliment asked the monk on duty, "Are you the fish friar?" "No, sir," retorted the brother, "I'm the chip monk."